We achieve our results by using positive displacement pumps to send micro amounts of oil (in a spray pattern) down to the saw blade. Where this concept is nothing new, Unist has been able to cut oil consumption dramatically by switching the customers oil to Coolube 2210AL. In one instance, we reduced the oil consumption from 6 litres per day to 250ml. 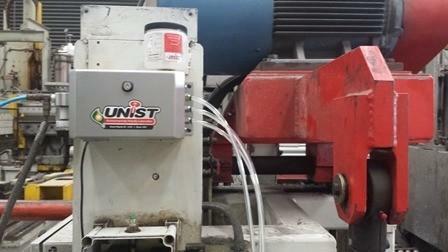 Unist has many excellent examples and a vast amount of knowledge when it comes to aluminium extrusion. One of the major demands of the customer is that the oil used must not stain the finished product as this will result in a product recall and unhappy customers. Our Coolube 2210AL does not stain, contains no paraffin’s, no mineral products, no silicone, produces no VOCs, and does not leave a sticky residue. Our oil is a vegetable oil which we define as an Advanced Metal Cutting Lubricant.